It was all about 1982 at Busch Stadium last night. While the entire weekend is a celebration of the 30th anniversary of the St. Louis Cardinals World Series championship over the Milwaukee Brewers, Saturday night featured an Opening Day-style parade of ’82 Cardinals, both teams in throwback uniforms and even a retro pre-game show on Fox Sports Midwest with on-screen graphics and fashions from the time. So it’s only fitting that Adam Wainwright paid his own tribute to the team with his on-field performance. Of course he had the high socks on, as you can see in the picture at left. He had a complete game victory, needing only 98 pitches in the Cards 6-1 win that lasted only two hours and 19 minutes. And, as you also can tell from that photo, he even had a great night at the plate — two hits, including an RBI-double. Not much more he could have done. Wainwright allowed only five hits, struck out seven, walked none and retired 13 in a row at one point. Wainwright, working with pitching coach Derek Lilliquist in Colorado during a recent bullpen session to prep for this start, estimated he threw 35 to 40 straight fastballs in that session. 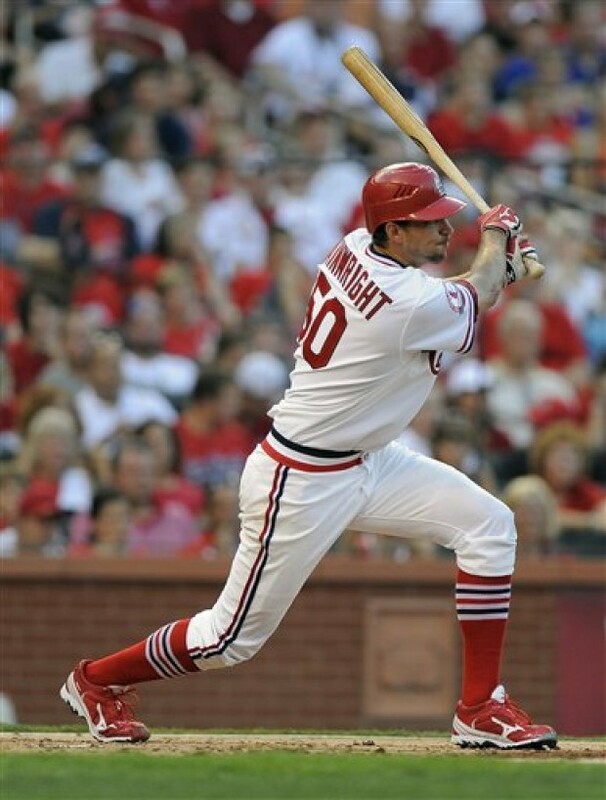 “The proof was in the pudding a little bit tonight,” Wainwright said. Waino even went old-school with his cliches. Carlos Beltran evened the score at 1-1 with a second-inning solo homer that wasn’t counted as such until umpiring crew chief Tim Welke consulted instant replay. He overturned what was first ruled a triple when video evidence confirmed that Beltran’s line drive cleared the right-field wall. St. Louis broke the game open against Brewers starter Mark Rogers in the third. Daniel Descalso, who had another sensational night on defense, led off with a double. Wainwright continued redeeming some personal pride by collecting his third RBI in his last three starts with a double to left. Singles by Allen Craig, Matt Holliday and Beltran pushed home another run. Yadier Molina followed with the big blow, a bases-loaded single to put the Cardinals up 5-1. Jay’s solo homer in the sixth capped the scoring for the Cardinals. Not mentioned, however: another stolen base for Yadi. Yes! He now has 11 for the season — and more than Mike Matheny had in his entire career. Last night’s win was the Cardinals 11th out of their last 15 games, and puts them at nine games over .500 for the first time since May 9 — which is the best they’ve been this season. Unfortunately, they’re not gaining any ground in the NL Central. The Reds won yet again, keeping the Cards eight games back in the division. In the wild card race, they are 2 1/2 back — the Braves and the Pirates lead those standings. Tonight the Cardinals will go for the sweep on ESPN starting at 7 p.m. They’re continuing the retro uniforms, going with the baby blue look tonight. Kyle Lohse gets the start against Marco Estrada. Finally, in case you missed this on Friday, check out one fan’s recollections on the 1982 World Series. It’s a great read.